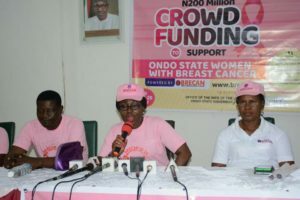 Founder of BRECAN and wife of the Ondo State Governor, Her Excellency, Mrs. Betty Anyanwu – Akeredolu kicks off Crowd Funding Initiative to support Ondo State women with Breast Cancer. 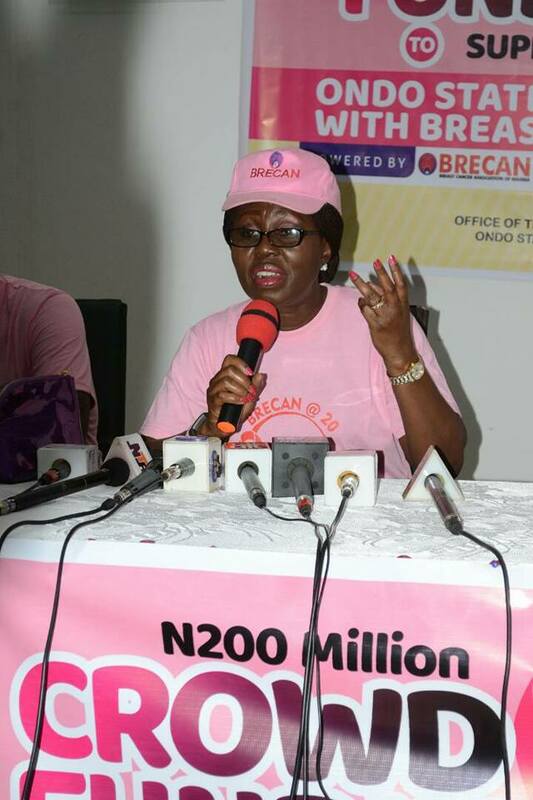 Speaking at a Press Conference held at the Banquet Hall of the Government House, Alagbaka, Akure, Arabinrin Akeredolu called for concerted effort in the drive to save underprivileged women afflicted with the breast cancer. 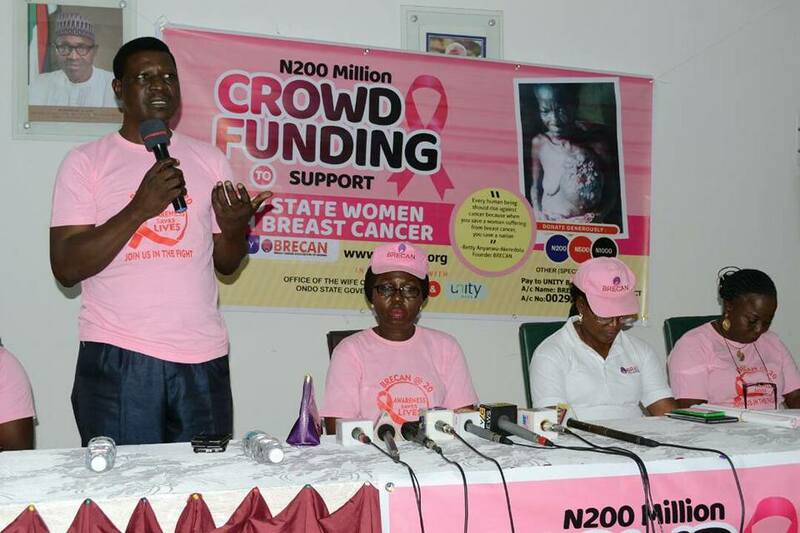 The highlight of the event is the announcement of the launch of the N200million Crowd Funding initiative as Arabinrin Akeredolu takes up the case of a patient with an advanced stage of breast cancer. She further explained that the money will be drawn from the account to support Ondo State women with Breast Cancer who can’t afford to access treatment. “My assignment here is to galvanize all of us here to do something. Quite a number of our women die of breast cancer because of ignorance and also because of lack of funds. Are we going to fold our hands and watch them die? We are adopting crowd funding so as to raise money to support our women who are suffering at different stages of cancer. I think we are over 3million people in Ondo State. If just 1 million of concerned citizens in Ondo State can afford to drop N200, that will go a long way”. While enjoining well meaning people to donate generously, Mrs Akeredolu assured that proceeds would be spent transparently and judiciously, an account has been opened with the UNITY BANK PLC. Mrs Umar of Unity bank, Lekki Branch in Lagos said anyone can donate from any part of the world. 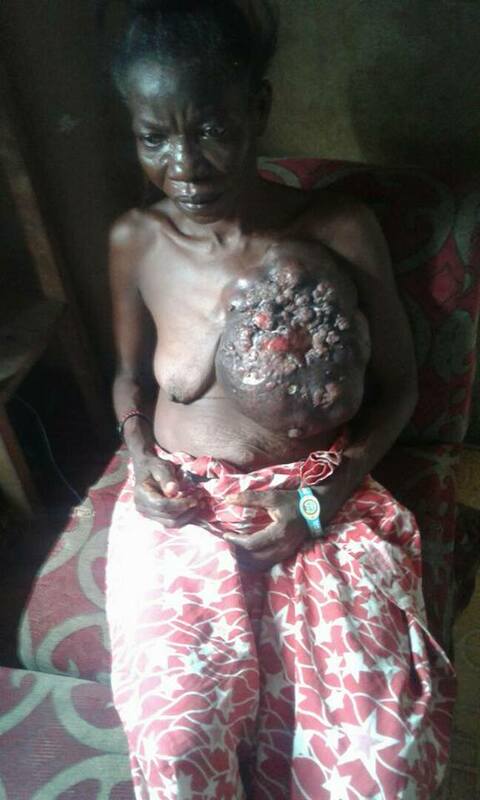 The Chairman, Okitipupa Local Government Area, Mrs. Morenike Alaka who brought to attention of the government and the public the critical state of Mrs. Kehinde Akingboye, a 45-year-old woman, with stage four Breast Cancer, who for the past 7 years said the patient stayed in-door for fear of stigmatization and lack of funds. According to her, women must be ready to come out and seek help in order to save their own life and government, with this initiative will be ready to help those in need of funds for treatment. “It is so unfortunate that most of us have not keyed into this awareness we are talking about. There are so many of our women out there that are hiding away from Doctors and shying away from going to the hospital. In his presentation, Dr. Katung Abah from the Federal Medical Centre, Owo highlighted the different stages of breast cancer, stressing that it is most unfortunate that some people even having seen the magnitude of their problem, still steer clear from seeking professional help. While noting that there is treatment for cancer, Dr. Abah emphasized that early presentation at the hospital increases chances of survival. “We have problem treating cancer patient because some of the time, most people don’t even believe they have cancer as an expression of faith or denial and at times, they do not have the money to access treatment”, he added while also affirming that it is pretty difficult for an individual to be able to cater for the cost of treatment which is quite expensive. Dr. Abah who applauded Arabinrin Akeredolu for her initiatives most especially the inclination to help the less privilege, stressed the need for the government to strengthen Nigeria’s health insurance policies in order to make access to health services an easy process. Breast cancer is increasingly becoming the leading cause of death of Nigerian women. Countless unknown Nigerian women in their small corners are dying needlessly from this disease that the advances in medical research is proving survivable. Late presentation due to ignorance is our main headache in the fight against breast cancer in Nigeria. More often than not, breast cancer sign is a painless lump. A woman finds this painless lump and breast cancer does not cross her mind because “it is not her portion”. She carries on with her life until she begins to feel pain. The deeply entrenched perception is that breast cancer is caused by juju or spiritual attack which is largely responsible for the huge patronage to prayer houses. It is frustrating to hear that educated and high income women when diagnosed with breast cancer expect miracle healing which is a gamble that ends up with the advanced (stage of the) disease. Until the mindset of an average Nigerian about what causes breast cancer and how it can be treated is changed and government, at all levels, deploys resources to raise awareness and create access to affordable treatment and care, Nigerian women will continue to die untimely from breast cancer due to ignorance and lack of funds. Breast cancer awareness is abysmally low in Ondo State coupled with the misconceptions about what causes breast cancer and how it can be treated. 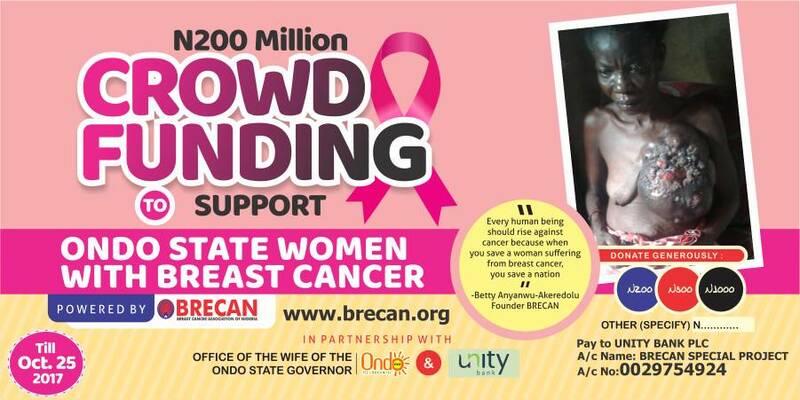 Given that most of the women with advanced breast are poor and cannot afford the cost of treatment in the hospitals, BRECAN has decided to embark on crowd funding to assist, firstly, those with advanced breast cancer access care in the hospitals as soon as enough funds are realized. Our outreach to all and sundry to donate is indicative of the realization that the fight against breast cancer is a collective effort and a subtle reminder that we are all in this together given that breast cancer does not respect anyone. EVERY WOMAN IS AT RISK OF DEVELOPING BREAST CANCER!